Adhesion - Unusually high adhesion to concrete, stone, wood, metal, glass, ceramic, rubber and a wide variety of plastic materials. Cohesion - When the resin is properly cured, the cohesion strength within the bond line is so strong and the adhesion of the epoxy to the materials so great that stress failure will often occur in one of the materials being bonded rather than in the epoxy. Shrinkage - Epoxy Glue cures with only a small shrinkage compared to other adhesives. As a consequence, less strain occurs at the bond line and it is stronger. Shrinkage is held to a fraction of 1%. . Stability - Epoxy glue maintains its dimensions and shape under prolonged stress. The stability combined with outstanding tensile, shear and impact strength makes epoxy glue unique among adhesives. Resistance - Unlike most adhesive materials, epoxy glue is highly resistant to moisture. Its resistance to solvents is outstanding. Insulation - Epoxy glue is an excellent insulator to both heat and electric current. Gluing stone, concrete, glass to aluminum, foam products together, bonding trim, cabinet shops, assembly and repair of fiberglass products, body repair sealant, and many other glue applications limited only by the imagination. Make sure surface is clean, dry and sanded. Mix equal parts of Part 1 and Part 2 thoroughly. Make sure glue becomes a uniform color and there is no streaking due to insufficient mix. Apply glue to both surfaces to be joined. It is not necessary to put pressure on the glue joint. Glue takes 3-4 hours to set at room temperature. Average complete cure should take 24 hours. This will vary dependent on the mass of glue used in the joint. The thicker the glue, the faster it will set. A very thin film of glue may take in excess of 24 hours to cure. External temperature also effects hardening. The higher the temperature the faster the cure. To speed up setting of the glue, a heat lamp may be used. Do not mix more glue than you are going to use. Once mixed, the glue will harden. When large amounts of glue are mixed, there is a short pot life in which to use the glue. A quart unit mixed at one time may gel in 10-15 minutes, which may cause considerable heat. Unless the glue can be used quickly, it is better to mix in smaller quantities or to spread the glue out before using to reduce heat generated and lengthen the pot life. TEMPERATURE MUST BE 65° F. OR OVER OTHERWISE WILL BE SLOW DRYING. 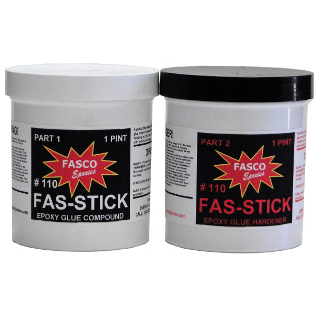 For a faster set, use 110-FS Fast Epoxy Glue. This film sets in 45 minutes @ 75 degrees F.
Determined on 1/8" thick test specimens at 25°C. Cured for 16 hours at 25°C. followed by 2 hours at 100°C. Percent weight loss after 24 hours at 150°C. Percent weight gained after 24 hours immersion in water at 25°C.